Dr. Charles Elachi is Professor (Emeritus) of Electrical Engineering and Planetary Science at the California Institute of Technology. From 2001 to 2016 he was the Director of the Jet Propulsion Laboratory and Vice President of California Institute of Technology. He is a fellow of IEEE and the American Institute of Aeronautics and Astronautics (AIAA) and a member of the International Academy of Astronautics (IAA). During his 16-year tenure as JPL Director; JPL launched 24 mission. 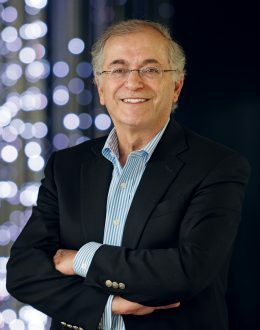 In his 40 year career at JPL, Dr. Elachi played the lead role in developing the field of spaceborne imaging radar which led to Seasat, SIR-A, SIR-B, SIR-C, Magellan, SRTM and the Cassini Radar. He received numerous national and international awards for his leadership in this field. During the late 80’s and 90’s as the Director of Space and Earth Science programs, Dr. Elachi was responsible for the definition and development of numerous JPL flight instruments and missions for Solar System Exploration, the Origins program, Earth Observation and Astrophysics. In the mid to late 90’s, Dr. Elachi chaired a number of national and international committees which developed NASA roadmaps for the exploration of neighboring Solar Systems (1995), our Solar System (1997) and Mars (1998). Dr. Elachi participated in a number of archeological expeditions in the Egyptian Desert, the Arabian Peninsula and the Western Chinese Desert in search of old trading routes and buried cities using satellite data, some of which were featured in National Geographic magazine. He has lectured and given keynote speeches at numerous international conferences and universities inside and outside the U.S., including Australia, Austria, Brazil, China, Denmark, Egypt, England, France, Germany, Greece, Holland, China, Japan, India, Ireland, Italy, Kenya, Monaco, Morocco and Switzerland. He was also a speaker at the Caltech Alumni Day and the Watson Lectures. Dr. Elachi has received numerous awards, including the most recent as the Aviation Week Lifetime Achievement Award (2016), 2016 RNASA National Space Trophy, 2016 IAF Allen D. Emil Memorial Award, American University of Beirut Honorary Doctorate (2013).